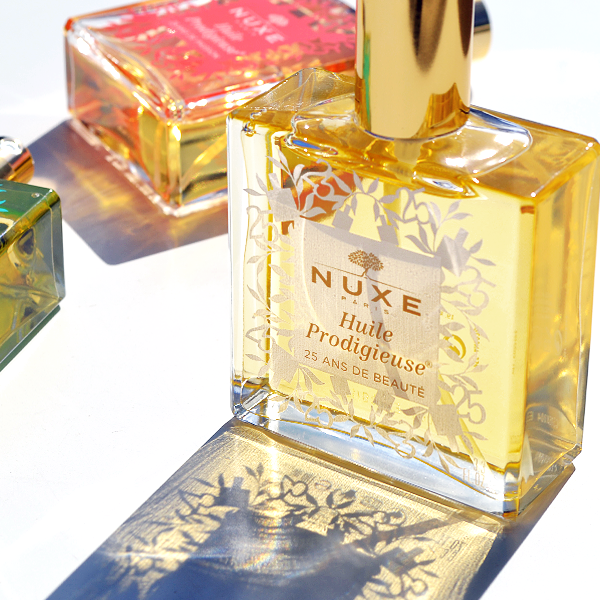 Nuxe Huile Prodigieuse Celebrates 25 Years! There are certain beauty products that go beyond cult status and become something far more powerful… they transform into a true day in, day out staple. And when that workhorse product is wonderfully luxurious, too? We’re talking beauty nirvana. This is the case with Nuxe Huile Prodigieuse, a French pharmacy icon and the jewel in the crown of Nuxe’s skincare offering. Originally introduced by Nuxe founder Aliza Jabes as the perfect multi-purpose product for busy, working women, Huile Prodigieuse performs a huge feat; it makes using an oil on a daily basis absolutely fool-proof. So you can forget an oily residue, or prolonged massaging-in, because this magic formulation provides all of the nourishment of an oil but with an incredible, imperceptible texture. If you’re already a die-hard convert, you’re probably wondering why I’m waxing lyrical about the French pharmacy grand dame. It’s all because 2017 marks a very special year for Huile Prodigieuse – it’s celebrating its 25th birthday! I talked a little bit about oil last week in my piece The Body Oil Breakdown. In the UK, we’re probably more likely to reach for a body lotion or body butter than an oil when it comes to sating our moisture needs. But our Continental sisters? They know that there’s nothing like a pampering oil for glistening, supple skin all year round. In the summer, oils give skin an incredible gleam and softness that makes your limbs look irresistible, while winter skin will lap up the moisturising benefits of oil to keep it supple all season long. Huile Prodigieuse’s goodness lies in its blend of 30% plant oils specifically chosen for their softening and smoothing abilities. These concentrates of tsubaki, sweet almond, borage, hazelnut, St. John’s wort, camellia and macadamia oils set to work toning your skin and providing long-lasting moisturisation without weight. It’s also important to note that the oil is completely free from mineral oil and also from silicones (there’s no artificial feeling of softness here). Aside from using Huile Prodigieuse as a straightforward skin hydrator, it can also be added to your existing face and body moisturisers for an extra boost, to the ends of your hair to smooth and add gloss, and into your bath water – I’ve even been known to add it into my foundation to give skin an extra glow. To mark its 25th birthday, Huile Prodigieuse is dressing up! 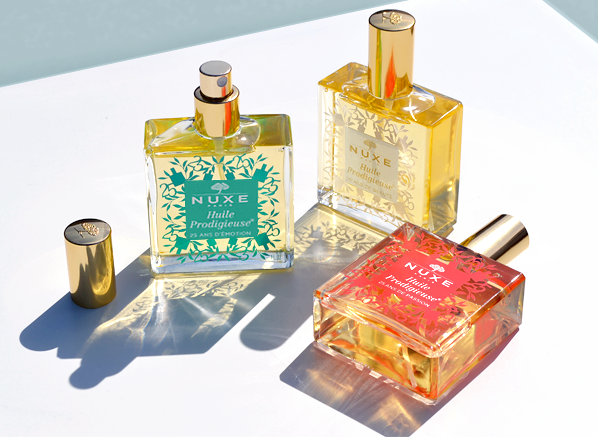 Nuxe has released not one, but three special edition bottles of its classic 100ml Huile Prodigieuse spray bottle: a lively green design to symbolise 25 years of emotion, a fiery pink design to symbolise 25 years of passion, and a fresh white design for 25 years of beauty. The one-off, summery print forms an homage to the story of Huile Prodigieuse, intertwining the silhouette of the bottle, the number 25 and a botanical motif for a fresh new take on the dressing table staple. Each of the designs will be around for a limited period, so it’s the perfect time to indulge in a piece of beauty history. 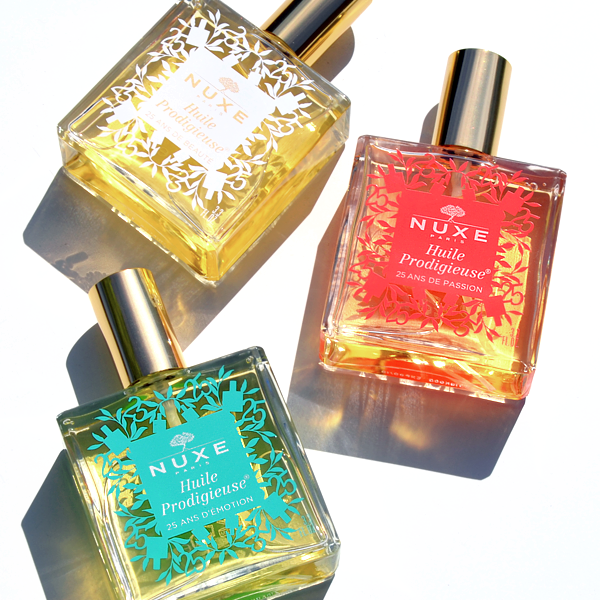 Win 1 of 3 Nuxe Huile Prodigieuse 25th Anniversary 100ml Sprays – you can choose your favourite colour! Head over to our Facebook competition here and let us know what you love about Huile Prodigieuse for your chance to win. Ends May 9th 2017, UK only. Best of luck! No purchase necessary. A purchase will not improve your chances of winning. Contest begins 2nd May 2017 and ends 9th May 2017. Winners will be selected in a random drawing on or about 9th May 2017. Three prize winners will be drawn. If the winner doesn’t respond within 7 days, the competition will be redrawn. Prizes must be accepted as awarded; not redeemable in cash or credit. This entry was posted on Tuesday, May 2nd, 2017 at 12:09 pm and is filed under French Pharmacy, New products, Skincare, Tried & Tested. You can follow any responses to this entry through the RSS 2.0 feed. You can skip to the end and leave a response. Pinging is currently not allowed.